Be the first to share your favorite memory, photo or story of Jack . This memorial page is dedicated for family, friends and future generations to celebrate the life of their loved one. 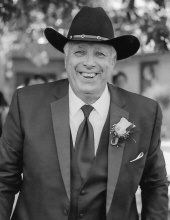 Jack Ivan Larson, 70, son of Ivan and Oliviene Larson passed away on April 12, 2019, on his farm. Jack was born on November 30, 1948, in Jefferson, IA and grew up with his younger brother Gary on the family farm in rural Guthrie County. He graduated from Guthrie Center High School in 1966 and attended Iowa State University obtaining a degree in Agronomy in 1969. After graduating college, Jack married Becky Burt and they had 3 girls, Carrie, Erin, and Julie. He joined the U.S. Army Reserve in 1970 and was an active member through 1977. In 1974 he moved back to the homestead where he was raised and started his own farming operation with row crops and cattle. Jack also made a career working at John Deere in Ankeny as a machinist for 39 years. On July 30, 2005, Jack married Beverly DeWitt. Together they enjoyed trips to Alaska and Utah and spending time with each other fishing and sharing their love of animals. Jack was a member of the Guthrie Center American Legion Omar B. Shearer Post 124. Farming, hunting and fishing, and spending time with his grandchildren were some of his favorite past-times. Jack learned the importance of hard work from a young age, as he was always by his dad’s side helping with everything on the farm. This upbringing instilled the love of farming in him which he continued to do his entire life. He took great pride in sharing the joys of farming with his grandchildren and helping Rylee and Gavin raise cattle to show for 4-H.
One of the highlights every year for Jack was the shotgun season-opening weekend of deer hunting. Jack had a keen ability to spot the biggest bucks in any terrain and looked forward to his friends and family gathering at the farm to hunt, play snooker, play cards, and shoot the breeze. He was also a kid at heart and spending time with his grandkids helped keep him young. He found ways to pass on his own life lessons by teaching them how to hunt and fish, care for cattle, and drive the tractor and 4-wheeler. He also couldn’t resist their requests for ice cream and enjoyed the simple moments laughing with them along the way. Jack had many hobbies that kept him busy including muscle cars, collecting and restoring antique John Deere tractors, playing cards and caring for any animal in need. He enjoyed using his hands, not only to farm but to also restore antique John Deere tractors which he drove in tractor rides and parades. He also had a need for speed. Jack loved driving his old beaters in demo derbies and attending drag races. He also had partial ownership in a race car at Boone Speedway; he didn’t drive it but always wanted to. In his retirement, he spent as much time as possible attending muscle car shows and even purchased one to enjoy in his golden years. Jack was a friend to everyone and could carry on a conversation with anyone for hours on end. He valued time with his friends and played practical jokes on them as often as he could. Jack had big hands that suited him well in his career but had an even bigger laugh and heart and he will be missed by many. Jack is preceded in death by his grandparents Marius and Lula Larson and Frederick and Clara Wiese and his father Ivan Larson. Jack leaves behind his wife Beverly Larson, daughters Carrie (Darin) Sloss of Guthrie Center, Erin (Peter) Smith of Lakeland, MN, and Julie (Jacob) Meyer of Grinnell. He is survived by 7 grandchildren Rylee and Gavin Sloss, Tillie, Roger, and Paul Smith, and Brody and Jana Meyer. He will also be missed by his mother, Oliviene Larson, brother Gary (Angie) Larson, parents-in-law Max and Dorthy DeWitt, and sisters- and brother-in-law Betty DeWitt, Bob (Carolyn) DeWitt, and Barb DeWitt as well as many nieces and nephews, other family members and friends. A funeral will be held to celebrate Jack’s life on Thursday, April 18th at 10 am at Immanuel Lutheran Church in Guthrie Center. Burial will follow at Dalmanutha Cemetery in rural Guthrie County. His celebration of life will conclude with a luncheon at the Immanuel Lutheran Church Fellowship Hall. Visitation will be held at the Twigg Funeral Home in Guthrie Center on Wednesday, April 17th with family present from 5 pm to 7 pm. To send flowers or a remembrance gift to the family of Jack Ivan Larson, please visit our Tribute Store. "Email Address" would like to share the life celebration of Jack Ivan Larson. Click on the "link" to go to share a favorite memory or leave a condolence message for the family.